The Western United States is getting large quantities of smog and pollution coming via "westerlies" across the Pacific Ocean. The United States gets a lot of exports from China, but a new study shows that one of the things we are getting from that country may have even more negative implications than lead-based toys. "We've outsourced our manufacturing and much of our pollution, but some of it is blowing back across the Pacific to haunt us," said Steve Davis, a scientist at University of California Irvine, and co-author of the study put together by a team of Chinese and American researchers and published by the U.S. National Academy of Sciences. 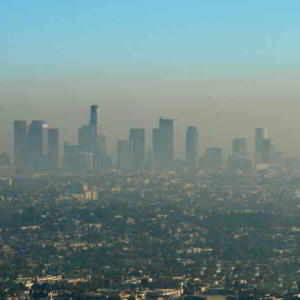 The report noted that cities such as Los Angeles, which already has its own grey haze problem, may get as much as one extra day of smog a year as a result of pollutants such as nitrogen oxide coming from China. China does a lot of production for Western countries, and the research said that in 2006, as much as 17 to 36 percent of the country's pollution comes from export industries. About one fifth of that could be traced back to U.S.-specific exports. Trade agreements with China need to include provisions for cutting the amount of pollution coming from the country, a problem that neighbors Japan and South Korea have faced for years. But China has said that it wants help from the West to curb the problem, since the production causing the pollution is for goods heavily sought by the West. "International cooperation to reduce transboundary transport of air pollution must confront the question of who is responsible for emissions in one country during production of goods to support consumption in another," the report said. It doesn't matter who takes the lead on cutting back on these emissions as long as it gets done. While the West Coast may be getting the brunt of the hit in the United States, pollution and the greenhouse effect continue to be a global problem.